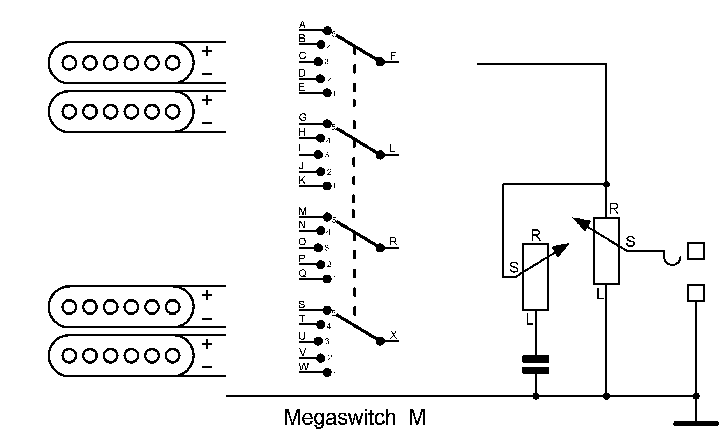 You haven’t found your ideal schematic among our range? Then create your own based entirely on your own concept. 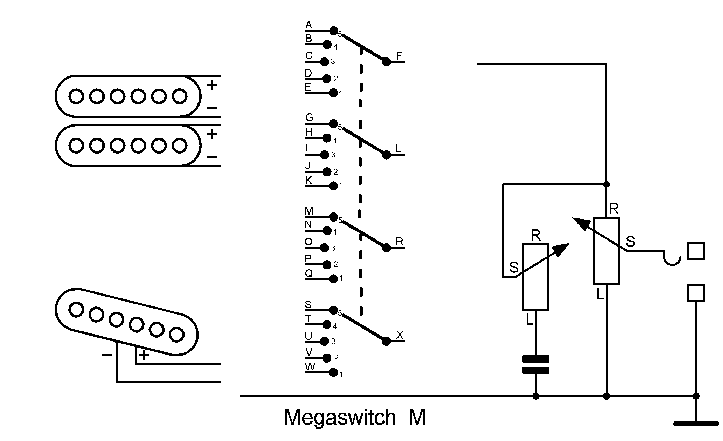 The Megaswitch M offers you a broad range of options for many coil combinations. We’d like to help you do this. We have prepared a number of semi-complete diagrams to get you started. You can complete these using a standard digital image processing program or you can simply print it onto paper and go to work on it with pencil and eraser. Here are some tips before you begin: Generally, you can switch the individual coils parallel to each other or in series. It is important however, to consider the electric polarity, similar to when using batteries. At a first glance, this may not seem to make sense, as pickups always produce AC voltage. When you are using only one coil, the polarity doesn’t matter. However, when you put two or more coils together, these can work out of phase, particularly if they are made by different manufacturers. Pickups that are out of phase produce a very weak bass range. They also make your overall sound hollow and tinny. It is better to check the polarity of your pickups before you solder on the wires, to avoid any nasty surprises later. Unfortunately, when it comes to defining the polarity of your pickup coils, the color of the wires is no indicator, because there is no standard color coding for these wires and each manufacturer pretty much does their own thing. Sometimes the color of the wires varies even on pickups made by a single manufacturer. Frequently, the following leads to confusion: The "cold" wire (ground/earth wire; black wire or shielding is defined as minus and the "hot" wire (signal output; white wire or inner core of the cable) is defined as plus. In any case, it makes sense to check each one individually, irrespective of the color of the wires. 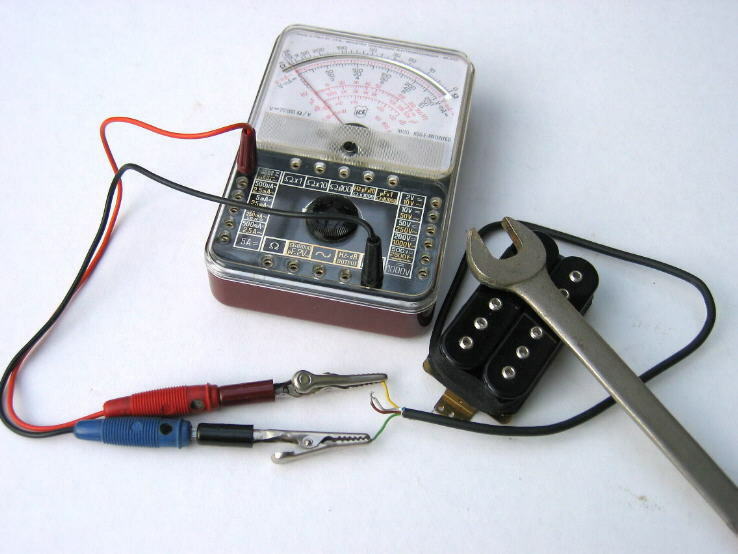 To check the polarity, you need a simple moving coil multimeter with pointer (see figure 1), which is quite affordable and widely available in electrical supply stores. A digital device is not suitable. 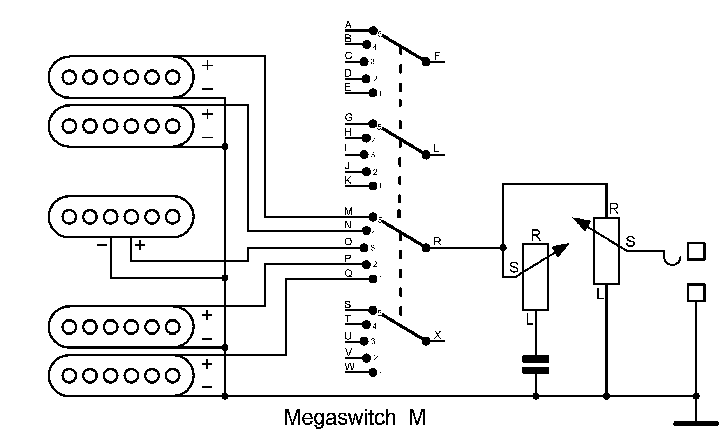 To begin, select the most sensitive measuring range (usually 100 mV/ 50 µA), then connect the wires of the pickup to the device. Using an iron object such as a spanner or scissors, allow the pickup to magnetically “pull” it by holding it close to the pickup. This causes the pointer on the instrument to move a bit either to the left or to the right. When you take the metal object away again, the pointer swings to the other side. 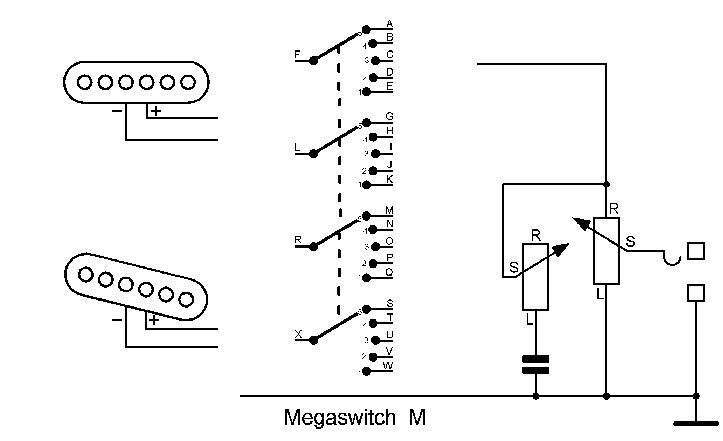 If you do this with different pickups, you can observe that some types start left, then go to the right, whereas other pickups work the other way round, i.e. they start left, then go right. In any case, when you swop the pickup wires, the direction changes, meaning a left-to-right reading will change to right-to-left. The polarity of a coil is best defined as follows: Connect it to the instrument so that the pointer goes to the right when you let it magnetically „pull“ an iron object and goes to the left when you remove it. 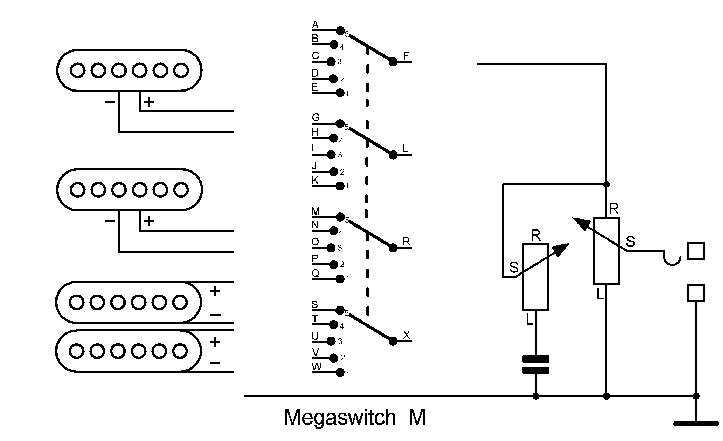 Then the pickup wire which is connected to the positive terminal of the instrument is “positive” and the other one is “negative”. If two or more coils are combined they normally should work in phase with each other. 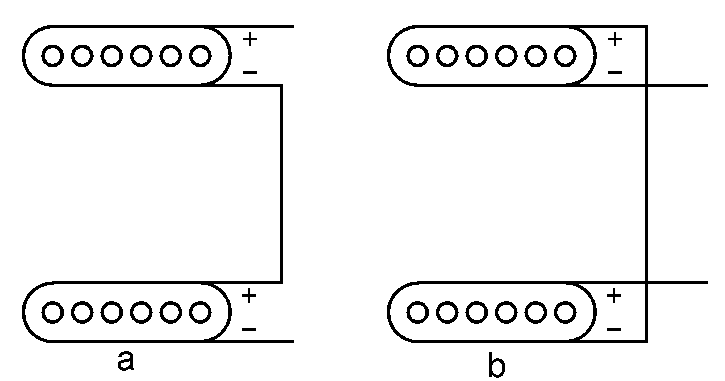 When switching parallel, you connect plus poles to plus poles, and accordingly, minus poles to minus poles (figure 2). 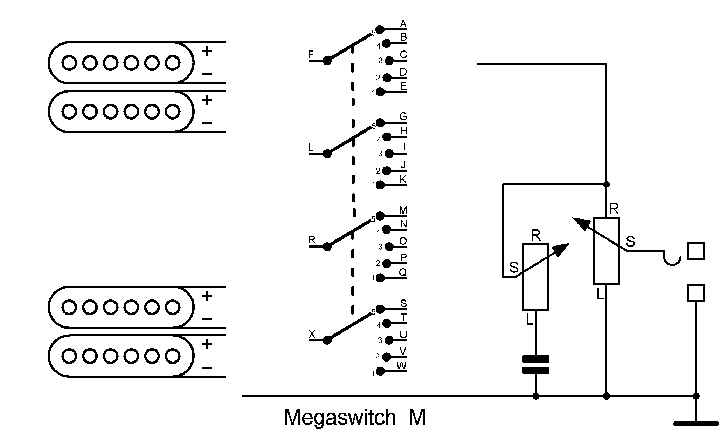 To configure in phase switching in series, connect the plus pole of one coil with the minus pole of the other (figure 3a/b). Usually, out of phase configurations are not that popular. Nevertheless, if you choose to do this, here is how to do it. 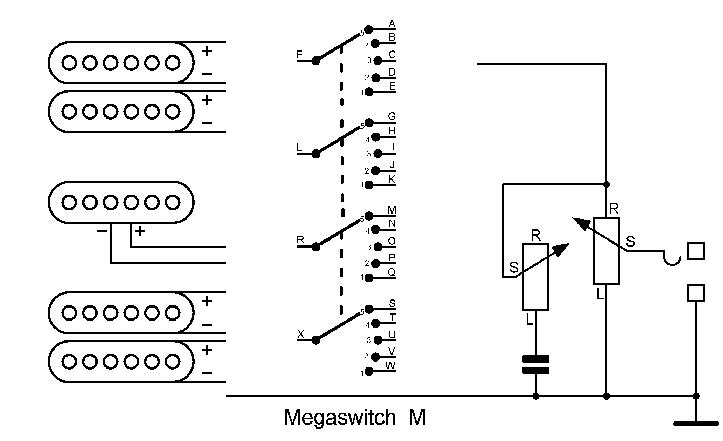 Connect, in parallel switching, the plus pole to the minus pole and vice versa (figure 4a). You can make the sound a bit fatter by reducing the bass on the bridge pickup by installing a capacitor in the signal path (figure 4b). The value of the capacitor is a matter of choice, but a good start for experimenting is 0.022 µF, for example. 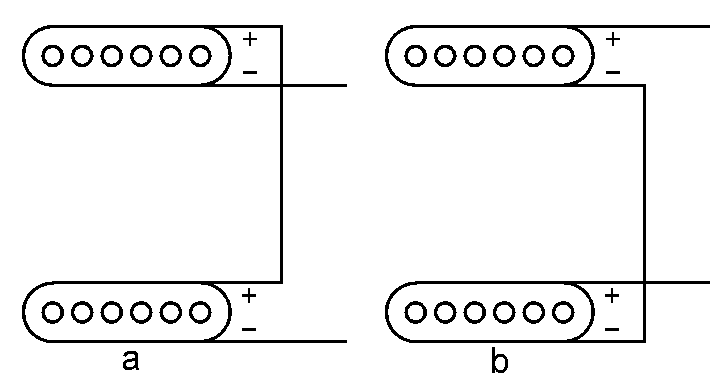 When switching in series, you connect the two plus poles or two minus poles together (figure 5 a/b). If you want to have two pickups working out of phase, then they should be placed as far away from each other as possible. On a Stratocaster, this would mean the neck and the bridge pickup; using the middle pickup combined with either the bridge or the neck pickup would make your sound much too thin. 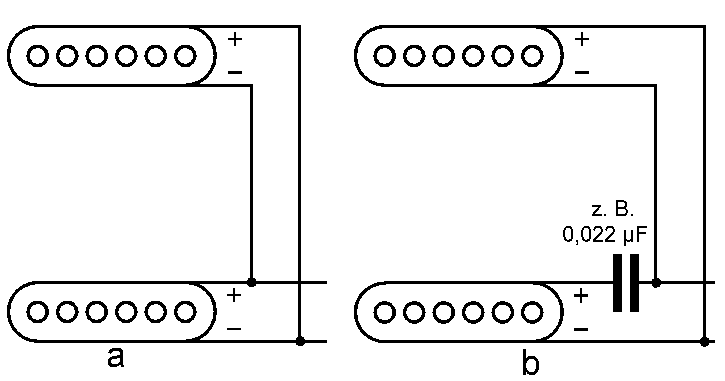 The two coils of one and the same humbucker always must be connected in phase, either in series (figure 6a/b) or parallel (figure 6c). It makes no sense to use out of phase connection here, neither in series (figure 7a/b) nor parallel (figure 7c). The sound produced would be much too quiet. Figure 7. Not like this! 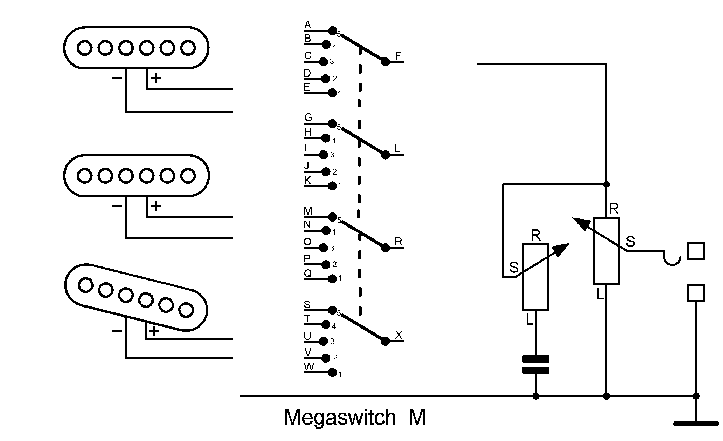 Out of phase configurations of two coils on a single humbucker are unusable. Now you can begin. Let your creativity flow. Invent new ways of wiring that no-one else has come up with until now. You don’t need to have studied electronics to do it. All you need is common sense. Nothing can go wrong. One last tip: Coils that should not be active in a particular switching position can be deactivated by either switching them off, or by short-circuiting them. This gives you even more options. 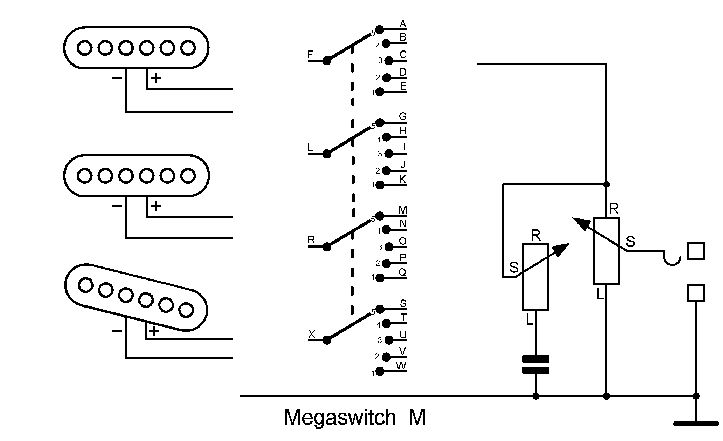 Below you can find a range of semi-complete switching diagrams for seven of the most common guitar types. 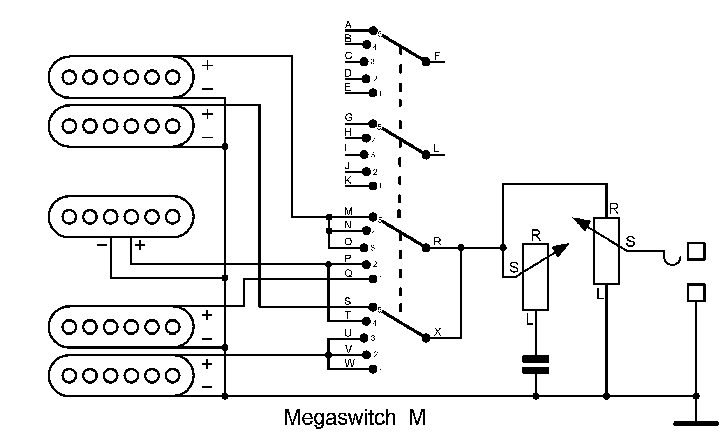 Each of them includes two different options for positioning your switch, depending on what suits your design best. 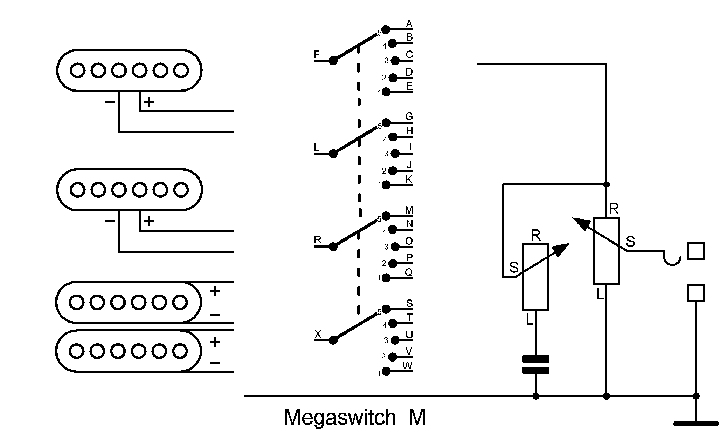 The switching positions are as follows: 1= bottom (bridge), 2 = second from the bottom, 3 = middle, 4 = second from the top, 5 = top (neck). 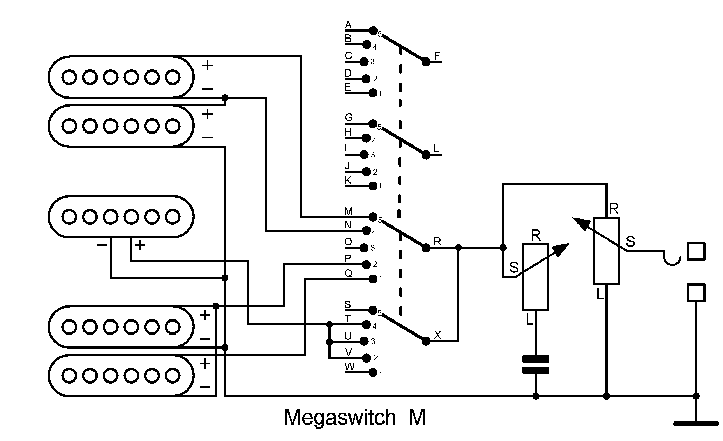 The symbols on the potentiometers are as follows: L = left position, R = right position, S = wiper. 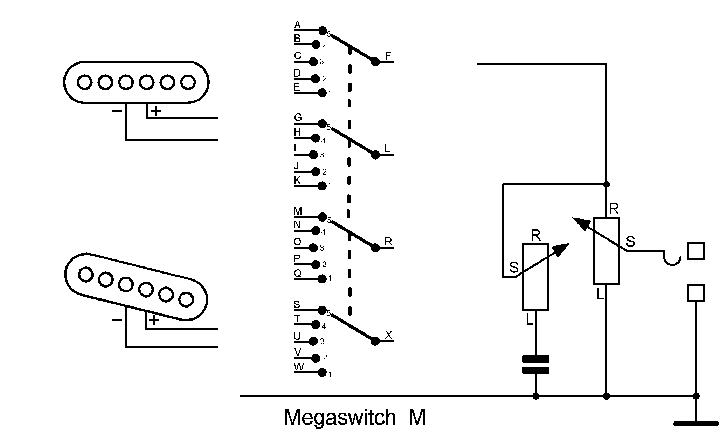 On right-hand guitars, the Megaswitch is located with the printed circuit facing towards the strings; on left-handed guitars it faces away from the strings. Here a few examples of how to proceed. As a starting point, we use a guitar with HSH configuration. However, you can apply this to other models without difficulty. The coils which you don’t have simply do not apply in the diagram, which makes everything easier. In principle, the range of options is nearly unlimited. One very simple option is to activate just one of the coils. 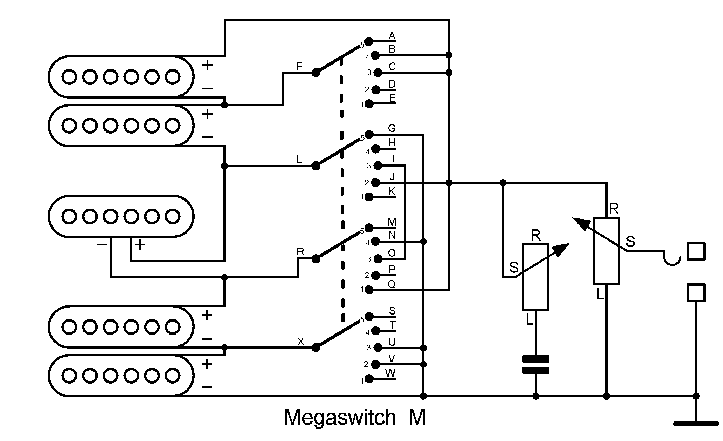 Then, one of the four segments of the switch is sufficient. It doesn’t matter which one you use. 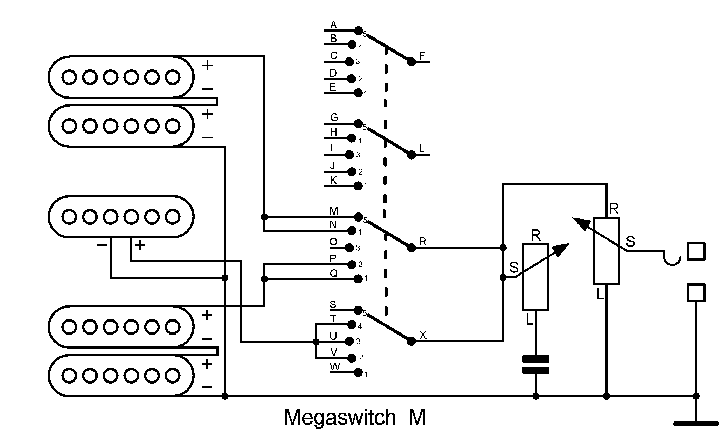 The switching diagram for this is illustrated in figure 15. 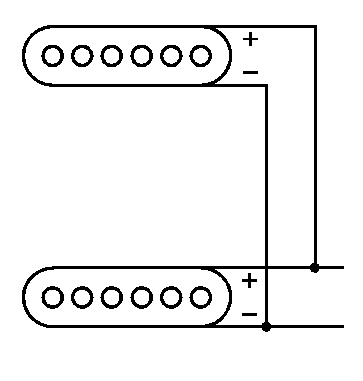 If you wish to switch two coils parallel in all switch positions, you need two segments, see figure 16 for example. 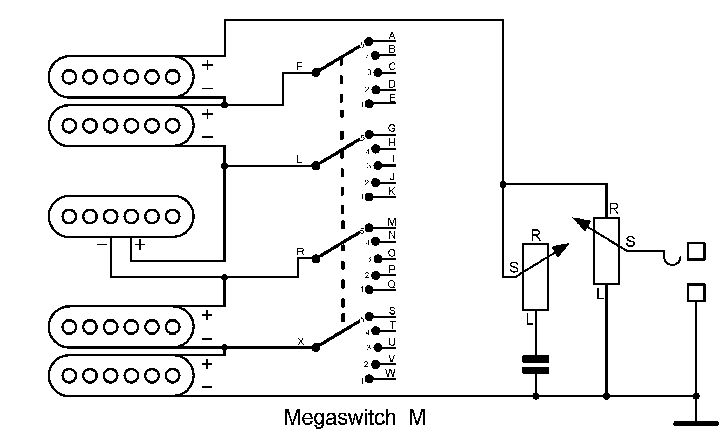 A switching option for the above is illustrated in figure 17. This is illustrated in figure 18. Maybe you’d like to configure a number of pickups in series. This is also quite easy to do. To start, you can use the layout in figure 19. 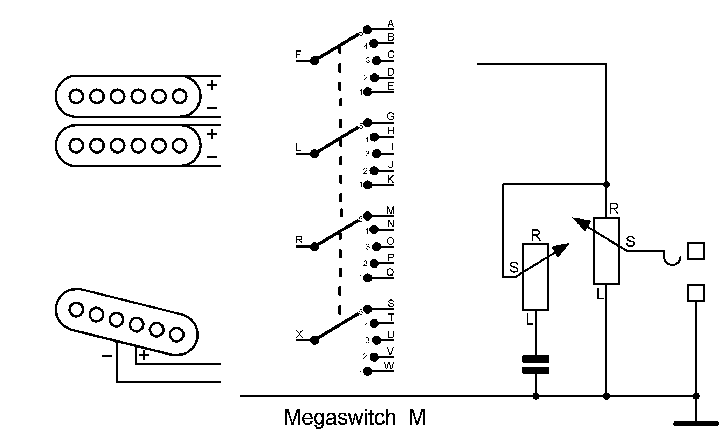 Here, all five coils are in series, and the connecting points between them are connected to the four middle contacts of the Megaswitch M. You can make as many connections as you like on the right hand side and simply short-circuit the coils which you don’t need. This is illustrated in figure 20. 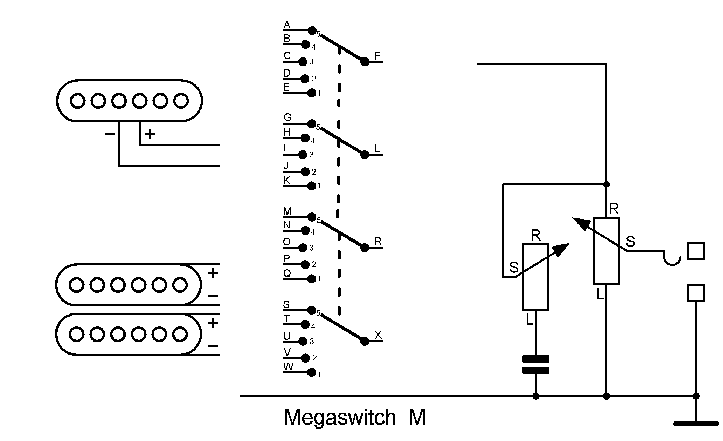 With these introductory examples we hope to have fired your imagination and that you can now create your own dream switching configuration.